The menopause and its symptoms most commonly affects women between the ages of forty and fifty. However, even during postmenopause you may continue to suffer from similar symptoms. These can include hair loss, fatigue and vaginal dryness. However, one of the most disconcerting postmenopause symptoms for many women is memory loss. While other symptoms can have more visible consequences, memory loss can be very disconcerting and frustrating. Read on to learn more about postmenopause memory loss. The onset of menopause is brought about by hormonal changes in your body. Because hormones let you know when you're hungry, tired or in pain, keeping them balanced is vital. However, when your hormone levels fluctuate, as they are prone to do during menopause, the body is likely to respond in ways that are commonly termed as "menopause symptoms". These hormonal imbalances can unfortunately persist even into postmenopause, and trigger symptoms that include memory loss. Read on to learn how to combat memory loss. When you experience memory loss during postmenopause, keeping up with the world can be tricky. You're not only contending with other menopause symptoms like vaginal dryness and panic disorders, but you also keep forgetting what day it is! When all these symptoms culminate, it is natural to become irritated and stressed. However, treatment options exist that will help you re-balance your hormone levels and help improve your postmenopause experiences. Unfortunately there is no simple cure-all treatment for memory loss or any other menopause symptoms. However, many women find that there are herbal remedies that can improve their experience. Scientific studies have shown that by mixing ginkgo biloba and ginseng together it is possible to create a concoction that increases your brain's functioning rate. The combination is thought to not only boost your concentration, but also sharpen your memory. Evidence of the herbs combined potency can be noted in their use as a treatment for Alzheimer's disease in certain countries. 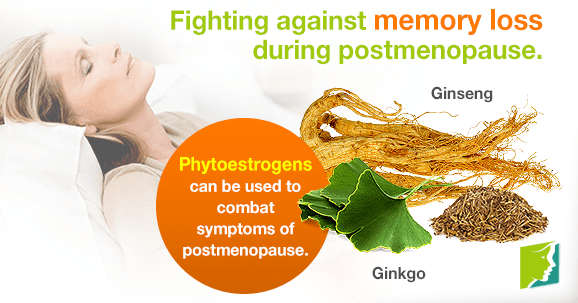 Ginkgo biloba and ginseng can also be used together to combat other symptoms of menopause because they contain phytoestrogens: super-compounds found in plants that share genetic similarities to estrogen. These compounds work by mimicking the effect that estrogen has on living organisms. However, speaking with your doctor before starting a course of the herbs is advisable as ginkgo and ginseng phytoestrogens can have side effects. Click in the following link to learn more about memory loss treatments. Dr. Devi, Gayatri. (n.d). "Memory Loss, Estrogen, Menopause & Alzheimer's Disease". The New York Memory Services.Retrieved from www.nymemory.org. Dr. Devi, Gayatri; Hahn, Katherine; Massimi Stephen; Zhivotovskaya, Emiliya.(n.d). Prevalence of memory loss complaints and other symptoms associated with the menopause transition. Gender Medicine, 2005, vol. 2. Myers, Catherine E.(n.d). "Categories of Memory Systems". Memory Loss & the Brain.Retrieved from www.memorylossonline.com. News-Medical.Net..(n.d). "Memory loss and menopause".Retrieved from www.news-medical.net. Does Memory Loss Cause Depression? Memory loss is one of the lesser-known symptoms of menopause, yet it's one that can have a huge impact on a woman's self-confidence. Understand why memory loss occurs during menopause and learn ways of combating it. Understand why memory lapses occur during menopause, and learn ways of dealing with them and improving memory.